Видно, что над проектом старались. Посмотрим его поближе, пощупаем из чего он слеплен. Короче мой скромный депчик: The amount of 10 USD has been withdrawn from your account. Accounts: -> U18767850. Memo: Shopping Cart Payment. Invoice 1675, Geringhoff.. Date: 21:20 11.02.19. Batch: 246163046. Админ не подведи! 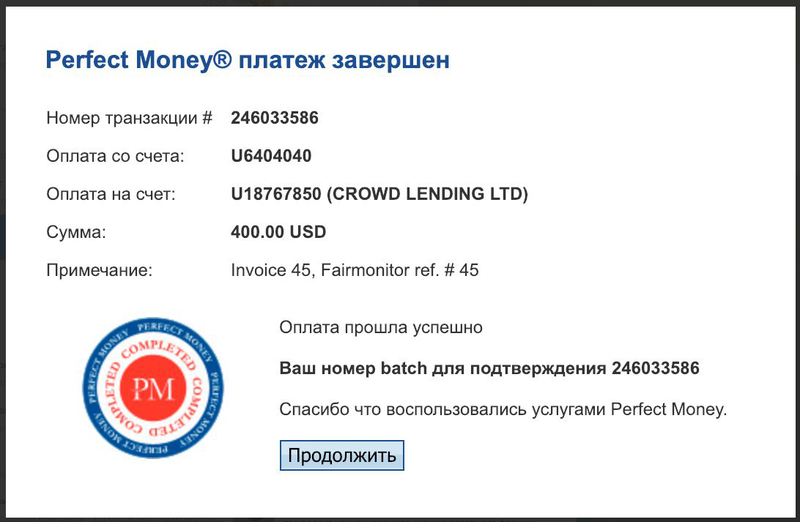 CROWD LENDING LTD	+0.5	Received Payment 0.5 USD from account U18767850. Memo: API Payment. Payment to user Fairmonitor from CrowdLending.live. CROWD LENDING LTD	+2.5	Received Payment 2.5 USD from account U18767850. Memo: API Payment. Payment to user Fairmonitor from CrowdLending.live. CROWD LENDING LTD	+1.25	Received Payment 1.25 USD from account U18767850. Memo: API Payment. Payment to user Fairmonitor from CrowdLending.live. Memo : API Payment. Payment to user hyipcruiser from CrowdLending.live. The amount of 5.67 USD has been deposited to your account. Accounts: U18767850->U1*. Memo: API Payment. Payment to user Ruslanis from CrowdLending.live.. Date: 08:18 12.02.19. Batch: 246202510. The amount of 10.9 USD has been deposited to your account. Payment to user bolto from CrowdLending.live.. The amount of 5.67 USD has been deposited to your account. Accounts: U18767850->U1*. Memo: API Payment. Payment to user Ruslanis from CrowdLending.live.. Date: 08:13 13.02.19. Batch: 246337538. Memo: Sent Payment 300.00 USD to account U18767850. Memo: Shopping Cart Payment. Invoice 4949, monhyip. The amount of 100 USD has been withdrawn from your account. Accounts: U11110**->U18767850. Memo: Shopping Cart Payment. Invoice 5302, InvestFinBiz.. Date: 11:22 14.02.19. Batch: 246493656. The amount of 1 USD has been deposited to your account. Accounts: U18767850->U11110**. Memo: API Payment. Payment to user InvestFinBiz from CrowdLending.live.. Date: 12:33 14.02.19. Batch: 246501821. The amount of 1 USD has been deposited to your account. Accounts: U18767850->U11110**. Memo: API Payment. Payment to user InvestFinBiz from CrowdLending.live.. Date: 12:33 14.02.19. Batch: 246501844. The amount of 1 USD has been deposited to your account. Accounts: U18767850->U11110--. Memo: API Payment. Payment to user InvestFinBiz from CrowdLending.live.. Date: 12:33 14.02.19. Batch: 246501837. The amount of 1 USD has been deposited to your account. Accounts: U18767850->U1111--. Memo: API Payment. Payment to user InvestFinBiz from CrowdLending.live.. Date: 12:49 14.02.19. Batch: 246503651. The amount of 1 USD has been deposited to your account. Accounts: U18767850->U1111** Memo: API Payment. Payment to user InvestFinBiz from CrowdLending.live.. Date: 13:03 14.02.19. Batch: 246505374. The amount of 1 USD has been deposited to your account. Accounts: U18767850->U1111**. Memo: API Payment. Payment to user InvestFinBiz from CrowdLending.live.. Date: 14:24 14.02.19. Batch: 246515622.